Dylan and I were set to go for a walk after an early dinner when he said "I need to show you something." I came over to where he was sitting on the sofa and he held up his phone. 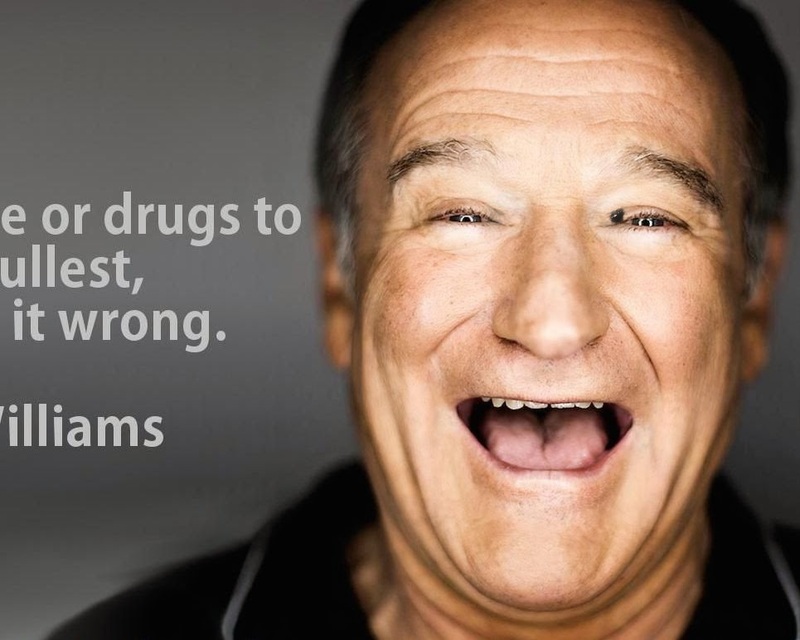 It was a CBC News story that Robin Williams was dead. My mouth said "This is a hoax, right?" while my brain figured out that it couldn't possibly be a hoax if CBC was saying it. Just before supper, I was out in the studio trying to decide what I would paint next. My shock gave way to resolve and I immediately went over to the computer to find a photograph of Robin that I could paint. There were so many. What would feel right, in terms of an expression, to capture the spirit of the man that brought us so much joy, while apparently dealing with so much sadness? As soon as I saw it, I knew this was what would help us remember the man, his artistry, his indelible gift to make us laugh, feel, question, wonder. Dylan came along shortly after his mother and I had watched Robin in Patch Adams at the movie theatre here in Fort McMurray in 1999. Something about that performance moved us both and it became our 4-pound infant's middle moniker. There is a small glimmer of Robin Williams in Dylan, as many of his friends will probably testify. He has a sardonic wit and always manages to bring light and fun into a conversation. I thought of Robin as I painted; I thought of Dylan. I thought of those folks who suffer from depression and other mental illnesses. I channeled Robin's luminescent craziness as I flung paint at the canvas, putting the finishing touches on my personal remembrance of the man, the myth, the comic and acting genius. Heather and I have decided that the right thing to do with this portrait is to accept bids on it and donate the purchase price to Some Other Solutions (SOS). Not only do they operate a crisis line that is there for people when they are at their lowest low, they also are working on the Stand Up For Mental Health program. This is where people who struggle with mental illness get to develop their stand up comedy skills and put on a show with David Granirer, an accomplished comedy coach, performer and a person who has depression. If you want to place a bid on this 12" x 24" painting, acrylic on canvas, please send me an email at russell@birdsongconnections.com or post your bid on Facebook. Let's see if we can inspire a donation to SOS that can turn a terrible tragedy into something positive.